Explanation: Perseid meteors rained on planet Earth last night. This year the stream of dust from periodic comet Swift-Tuttle has produced a stunningly active shower of bright cosmic streaks. In this 25 second long exposure, one luminous Perseid trail, fast and colourful with a small explosion at the end, is witnessed by night skygazers from Torralba del Burgo, Soria, Spain. A second fainter meteor trail appears well below the first. The two can be extended to intersect at the meteor shower's radiant just above the brighter stars of the heroic constellation Perseus. 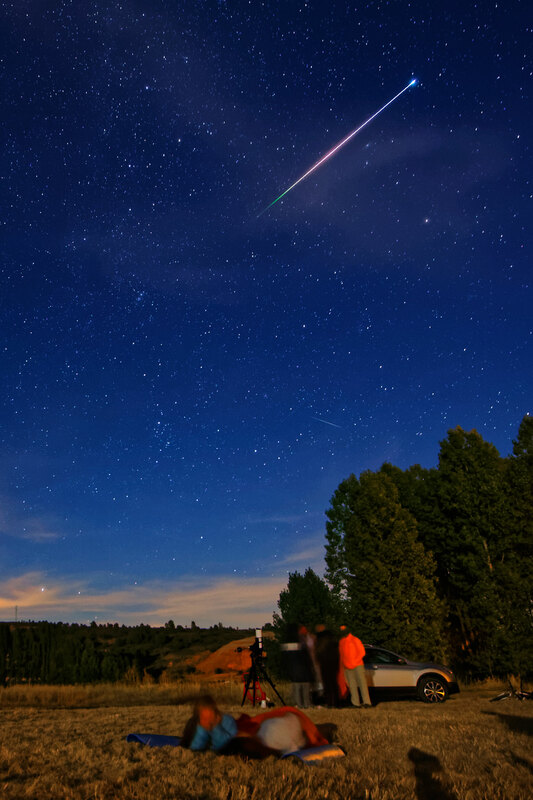 Though the meteor shower's activity is waning, in the coming days Perseids will still flash through the night. But you won't see any if you don't go outside and look up.